I first met pasta about 14 years ago. And it was not love at first sight. There were no explosions or angelic music. I ate it and thought it was good, but not crave-worthy. That was until I had some addictive pastas at Bucca De Beppo (yes, it is a chain Italian restaurant in the mid-west, and I LIKE it). I was glad that I got the table in the kitchen and was enthralled by the smells and sounds. And their Ziti with spiced tomato sauce and five cheeses was out of the world. I was kicking myself for not discovering the love for pasta sooner—so much valuable time lost. But then I also realized that what got me into pasta love was the spicy sauce. Of course, I like a creamy Alfredo as much as the next person, but a little zing to the sauce red or white was all I needed to kindle my pasta love. From then there is no looking back on the pasta to-do lists and the weigh scale as a result of all those ‘discovery experiments’. I know, I know moderation and all….but all my virtues get shattered, rather easily. I heard about Gnocchi among the other 600+ types of pastas, and somehow could not find it anywhere. Popular Italian restaurants in US did not regularly have this on their menu, nor could I find it in grocery stores even those that sell fresh pasta. I was left with the option of making if from scratch or mail ordering it. None were appealing either for effort or cost. And so went the want to try Gnocchi to the bottom of the pile. And then, I found Gnocchi with Basil Pesto on the menu of an Italian restaurant in Santiago, Chile of all the places I have been to!! But when I recently got my hands on some store-bought Gnocchi, I did not miss the chance to make something out of it. I paired it with a delectable cream sauce infused with White Wine and Curry Powder to mix things up. The verdict? I really loved the combo, although I would give this particular Gnocchi top ranks. It was a bit dense and gummy (aka store-bought). But the sauce alone kicked up the whole dish a few notches up. The flavor of White Wine married very well with Curry Powder. And the creamy base of the sauce coated the gnocchi well and held up the robust flavors. 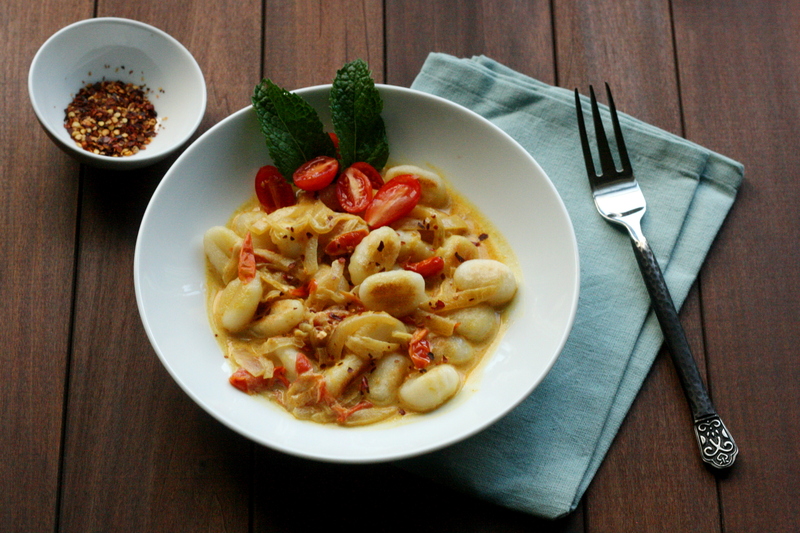 I can’t imagine how much better it would be with some fresh home-made Gnocchi…which is yet another excuse for me to make this again! Cook Gnocchi per instructions on the package, in salted water. Once al-dente, drain and drizzle some oil to prevent sticking. In the meantime, in a wide bottom pan, add Butter (or Oilve Oil). Add crushed Garlic and Red Pepper flakes and heat on low. Once Garlic starts turning golden, add Shallots (or Onions) and cook on medium heat till translucent, about 4-5 minutes. Add Curry Powder and Salt. Sauté for 2 minutes. Add Tomatoes and sauté for another for 3-4 minutes. Add White wine and deglaze the pan. Let the liquid (mostly wine) evaporate for about 2-3 minutes. Add Cream or Half and Half. Stir to mix the sauce evenly. Turn off heat. Plate Gnocchi and pour the sauce on top of it. Garnish with Parmesan Cheese and Cilantro. Pair it with your favorite White wine. This entry was posted in Fusion, International, Recipes, Vegetarian and tagged Fusion, Italian, Pasta, Vegetarian. Bookmark the permalink. I love experiments like these. Your sauce sounds absolutely delicious, and I’ve bookmarked it for trying. I have a question on the curry powder, though: is it a generic one (i.e. the “yellow stuff” you get at the supermarket), or did you use a specific kind, or even make your own? Ha ha Kiki…your question scared me…as I am just writing a post about the stigma of store bought curry powder (which I think is not correct). But to answer your question, I used the store bought yellow stuff, which is perfect for fusion cuisine. Stayed tuned for my next post! 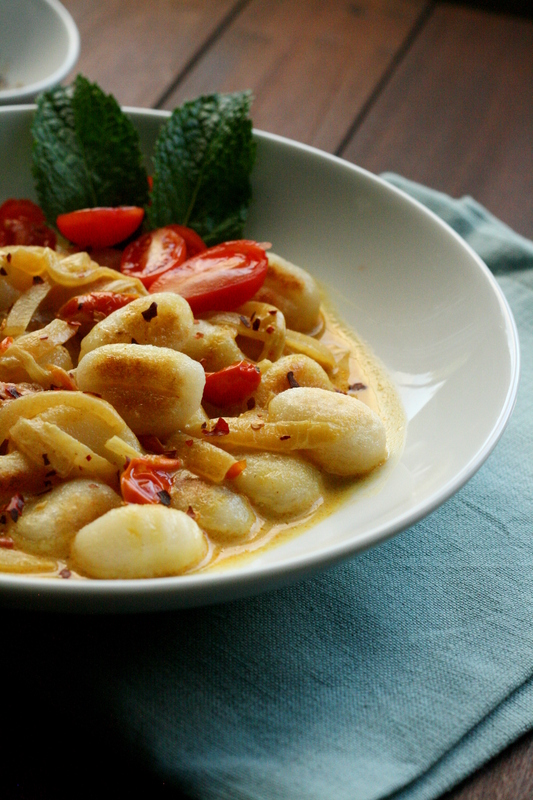 Making gnocchi is supposedly very easy, you should try it! All you need is potatoes, eggs, and some flour, from what I understand. Some recipes also use different varieties of potatoes. Beautiful dish and an interesting twist – I really like the idea. I’m wondering what’ll happen if I cook the gnocchi in the curry. Will it fall apart? Will it take too long to cook? Will it absorb just the right amount of juices from my tomatoes?